Experts across the fields of psychology, education, neuroscience, and technology, as well as from practitioners working in the field and designing educational programs suggest that in the present situation, education for young generations needs to be informed by the science of learning. Teaching and learning based on scientific evidence is key to developing the skills that is crucial for young people to thrive in a challenging world. The science of learning can provide guidelines for moving beyond identifying what skills are important to answering how to teach those skills. The Counselling & Career Services Unit (CCSU) believes that students at CFS should be introduced to this idea of reform in the education so that they would be able to cope with the demand and challenges in learning while studying at CFS. One of many ways of helping the CFS students to stay focus in their study and having the fighting spirit to overcome any challenges in the study is by organizing a talk programme on topic; Science of Learning. The speaker, Bro. Shamsuddin Abdullah from Department of Human Sciences (HS), CFS was able to deliver the topic to CFS student effectively. 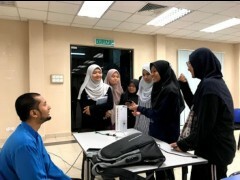 With his pleasant personality, commitment and dedication toward his profession as a lecturer, he managed to get the participants to stay focus with his talk from the beginning until the end. The way he delivered his talk was very interesting. He encouraged two ways communication in his talk session.